Ammonia Alert is an innovative color device for continuously detecting and monitoring toxic free ammonia. A sensor changes reversibly from yellow to green to blue, relative to the ammonia concentration. No test kits, chemicals, or procedures are needed. The device detects less than 0.05 mg/L (ppm) free ammonia and alerts you to the #1 killer before any sign of stress. It lasts over a year. Marine or freshwater use.In the absence of free ammonia the unit will assume a yellow or faint yellow-green color. It is normal for the dry sensor to have a greenish hue. It may take up to a few days for a dry sensor to equilibrate with the water. No sampling of water, chemicals, or test procedures are required. The presence of the free ammonia is detectable continuously with a response time of about 15 minutes. Response to decreasing ammonia is slower, requiring about 4 hours to go from TOXIC to SAFE on removal of ammonia. Many people have had problems with this product. I sure didn’t! It’s important to note that this product can read 0ppm Ammonia, even while a salicylate test kit reflects plenty of ammonia. “Total ammonia” measures ammonium and “free” ammonia. The former isn’t so bad, the latter is. More on this below, if you’re really interested. When my kids came home from a school carnival with 6 goldfish, I figured we’d wing it. A few days later we lost our first fish. Another few days, and another fish lost, and I bought the Seachem based on positive reviews I read elsewhere. At the same time, I had the water tested at Petsmart. The petsmart test said ammonia was high, and after letting the Seachem adjust overnight, it agreed. A few partial water changes later, and the level was dropping, but still not zero. I ordered an API test kit, and it reflected just what the seachem did. Finally, I got some filter media from a friend’s tank, and the nitrifying bacteria got going properly. Ammonia dropped to zero, and the seachem reflected this too! I had no luck with the “quick start” and other products that allegedly contain live bacteria. Only the filter media seemed successful in seeding the tank with the good bacteria. All in all, the Seachem functioned perfectly, and it really helped as a visual indicator and daily reminder that things were not going well in the tank. I’m now quite confident that the seachem will indicate if ammonia levels rise again. Now for the nitty-gritty: I believe so-called “ammonia remover” products bind ammonia into ammonium. While I tried these, I never saw a substantial drop in ammonia from it. My thinking is that these products attempt to reduce ammonia, but the problem is that ammonium breaks into ammonia at higher pH, and higher temperature. I’m not sure if there’s anything you can do about that. I’ve read on the Internet that the salicylate test does not reflect “total ammonia” (a term that refers to ammonium + ammonia), but it really does – both according to the API instructions and by looking at the chemistry, the test creates conditions to convert all ammonium to ammonia. It measures the total. The seachem measures purely free ammonia according to their site. 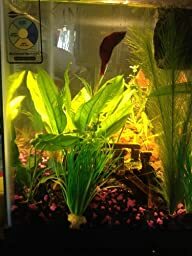 A quick update 1 year later – after some health issues with my fish, I treated the tank with an antibiotic. This killed off the helpful nitrifying bacteria too, and and the ammonia levels started to rise – the seachem reflected this, I confirmed with my API test kit, and I was able to change my approach. The helpful bacteria returned quickly this time, and the seachem again agreed with my API test kit – 0 ammonia. I remain VERY happy with this product. It’s been a year though, so I should probably test it, per their instructions, by holding it over a bottle of ammonia. First off, remove the plastic covering the sensor disk! I saw one of these in a friend’s aquarium where they hadn’t done that – so they assumed the “safe” readings they were getting meant their tank was doing great.. not so! I guess they figured it looked so simple they didn’t need to read the instructions first, but that’s a fairly obvious thing to overlook! Second, this is the exact same sensor material used in Seachem MultiTest Ammonia Test Kit. That test only tests for harmful free ammonia (NH3), but to be honest the test is a bit of a pain with having to time the test.. I never liked pulling it out, having to deal with the tiny little disks in the container, and waiting 15 or 30 minutes for the results.. but this alert is already ready to read (the color scale is not the same however, because of the longer “exposure” time). Third, kits like the API Ammonia Test Kit measure TOTAL ammonia (NH3 and NH4). 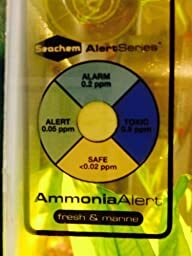 If you have chloramines in your water you WILL have tend to have false positive readings because of the ammonium formed when you use dechlorinator on your water (such as Seachem Prime. It doesn’t mean you water is dangerous, it simply means that the chloramine has been converted into ammonium, and the API test can’t tell the difference. I’ve had my tap water test as high as 2ppm for “ammonia” with the API test right after a water change – the Seachem test would show 0. The doesn’t mean the Seachem test is wrong or inaccurate, it’s just more specific – just like this alert disk. Because of the issue with chloramines in my tap water cycling a new tank is a frustrating experience trying to use the API kit. I would constantly see positive “ammonia” readings while I could see my nitrites had spiked and had gone to 0 and I was seeing increasing amounts of nitrates, but using these disks simplifies the process. A partial WC can be done as the disk starts to turn blue in a fish-in cycle (or if you are dosing ammonia for a fishless cycle, you can add ammonia a little at a time until the disk turns dark blue), and the effect can be seen quickly as the disk changes color from blue to green (or even almost yellow). I think it’s one of the best products available when you can’t rely on the total ammonia readings from the API kit. I was really skeptical about buying this because of all the bad reviews and none of my fish blogging friends had used it. BUT, It arrived in the mail and after a quick rearrangement of some plants and decor, I removed the plastic film and placed it in the tank. I waited 15 minutes (as it states that it registers ammonia within that time frame) and it read SAFE. I like that its small and can be placed anywhere. I don’t see how others had issues with this.